This Healthy Chocolate Chia pudding is so delicious you might confuse it with a chocolate chia seed dessert. Make this recipe as an overnight breakfast, or a quick and healthy snack or dessert. Chia Chocolate Pudding can be blended in a blender, or left as whole chia seeds. In a bowl, whisk together the chia seeds, almond milk, cocoa powder and maple syrup. Cover and set in the refrigerator to chill overnight. In the morning, you can mix everything together and serve, or blend the chia seed pudding with 1 tablespoon of almond butter. Top with granola, fresh berries and yogurt or whipped cream. 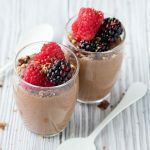 Get this recipe for Healthy Chocolate Chia at https://www.theworktop.com/breakfast-brunch-recipes/healthy-chocolate-chia-pudding-vegan-gf/.